Isabella Acres and Sally Field in HELLO, MY NAME IS DORIS. ©Roadside Attractions. CR: Aaron Epstein. 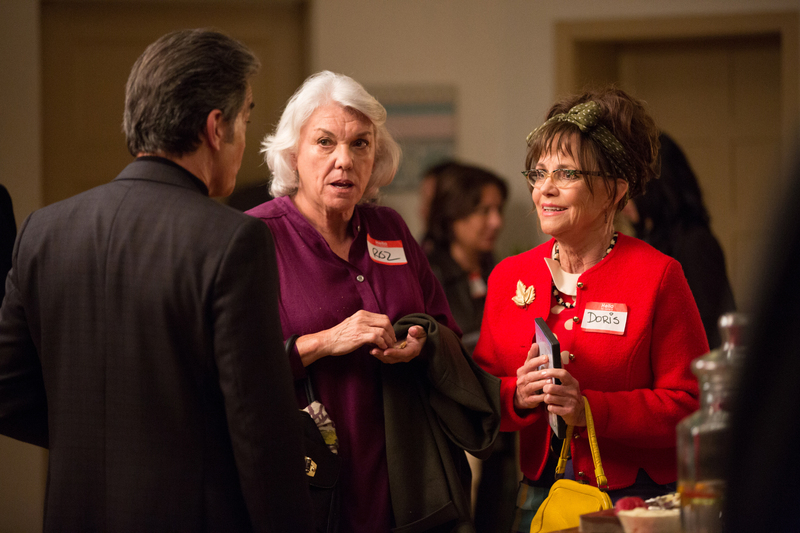 HOLLYWOOD—In the dramedy “Hello, My Name is Doris,” Sally Field plays a eccentric, wildly dressed office worker “of a certain age”—that age being her late 60s—who falls head over heels for much younger co-worker. Her affection for the handsome young fellow only deepens when he shows her kindness and even invites her out on what she assumes is a date. The fellow in question is simply being friendly and has no idea he has ignited some long simmering fire within this emotionally fragile woman. When Doris (Field) discovers John (“New Girl’s” Max Greenfield) already has a beautiful girlfriend close to his age, she plots to sabotage their relationship and win John’s love. Michael Showalter directed the dramedy from a screenplay he co-wrote with Laura Terruso. Field, 69, began her career in comedy, portraying a beach bunny on the 1960s sit-com “Gidget,” and a meddlesome holy woman in “The Flying Nun,” before becoming a serious dramatic actress in films like “Norma Rae” and “Forest Gump.” (She earned Academy Awards for her performances in the former as well as “Places in the Heart”). Field has remained relevant with today’s younger audiences having played Aunt May in two “Amazing Spider-Man” features. Her depiction of the first lady in 2012’s “Lincoln,” earned the veteran actress her third Academy Award nomination. The petite divorced brunette spoke at a press conference about playing the title character, suiting up for Doris and romancing a younger man. Q: Doris has lived her life kind of in pause. When she meets John, she reawakens. It’s such a contrast with your own life and career. Anything you regret not doing that you can identify with Doris? Field: We all have things that we look back on and think, “I should have, would have, could have.” For Doris, as opposed to me, she’s coming back to life. This is her first foray really into being fully alive and present. Because even as she tells the story of somebody she knew before, you can tell she was so stuck in some repressed place. We figured out that her mother must have had a very dominating influence on her. All of her emotions were in her interior. She’s emotionally inarticulate. She doesn’t have a way to clearly express what’s going on inside of her. John is the lure, is the bait that’s calling her out to reach outside of where she’s comfortable. We’re always in stages. That’s what being alive is all about. It’s always about the different stage you’re meeting in your life. It doesn’t end when you’re 16 or 17. It goes on. And then there’s another stage after that and another stage after that. The challenge is always will you embrace that change? Will you be new again? Will you be willing to be awkward and vulnerable and new again and not know where to put your feet however old you are? So it’s a coming of age story for someone of age, which is what we’re always doing. (It’s what) John is doing. John and Doris are in exactly the same place. It’s just that our ages don’t link up. But we’re talking to each other and meeting each other and contacting each other as human beings do because we hear each other, and that’s what humans need to do so. I don’t know if that answered your question but it doesn’t matter because that was such a good answer. You’ll write a question for it. Tyne Daly and Sally Field in HELLO, MY NAME IS DORIS. ©Roadside Attractions. CR: Aaron Epstein. Q: How involved were you in helping costume designer Rebecca Gregg in creating Doris’ look? Field: Totally. I completely, absolutely (was) a part of it. It wasn’t like Rebecca knew what (Doris) looked like either from the script. None of us knew what she looked like. Michael let us go and create her. What Rebecca did that was remarkable is that she created a roomful, rack after rack, of old clothes that she collected from the old clothing houses that almost don’t exist anymore. Western Costume, and the old Universal wardrobe that is huge and they’re getting rid of so much of it now, which is sad. She went to the thrift shops and Goodwill. She collected racks of things and most of it was disgusting, I mean, really rank and horrible. Rebecca and I would spend hours starting every morning, from the time Universal opened its doors, practically, we did the costuming at the Universal wardrobe department. We’d be there from early morning until late, late in the afternoon, I’d just try on things. I had it in my head what the hair was. I copied a picture of Brigitte Bardot, and asked if Brigitte Bardot’s hair is too 1961, except hers is blond, and it’s Brigitte Bardot underneath the hair. She had big, swooping bangs, which I cut off to make it just quite not right. And she wore that great big scarf around her hair. So we sort of knew what the hair was. And Doris just sort of emerged from all of those racks of clothes. When I’d put on a blouse and then a skirt, we’d go, “Wait a minute! Wait a minute! I think she’s coming!” It was like sculpting something. She just started to emerge from the marble. And then we’d call Michael and say, “Can you come?” He’d drive from his office, which wasn’t too close, but not too far, and at the end of the first day, we had one, maybe two outfits. And he’d go, “Yeah, yeah, you’ve got it!” By the end of the third day, we had almost all of them. The only time that Michael did not agree (with our costume choice) was the neon one. I kept saying, “What?” And he said he knew very clearly what it was. And I said, “What??? You can’t do that! It’ll be a joke. You’re going to tear the fabric of her character.” I was quoting Lee Strasberg. And (Michael) said, “Trust me. I know comedy. This is it! I know it! I know it! I know it!” And he was right. It was a leap of faith but every bit of this was for all of us. Q: Doris picks up stuff from the street and saves it in her room. I just moved out of my apartment and had to get rid of. Had you ever picked up stuff from the street? Are there some things that have been difficult to get rid of? Field: I think we’ve all done that. (She laughs.) No, I don’t think I’ve ever picked up anything off the street, maybe a penny for good luck. But certainly, being the oldest one up here, I’ve accumulated and accumulated and accumulated, and then I’ve transitioned in my life. I always seem to move at the same time. There’s something going on inside my head and I have to make a physical (transition), pack up and go to another place. You try to get rid of the things that are weighing you down. I’ve done that recently and I regret how aggressive I was with myself. It’s like, “Wait a minute!” Where’s that book? What was I thinking?” Books, I think you just keep books. Unfortunately, I learned that lesson too late. Q: You have a fun scene where you dance at a rave. Was your dancing choreographed? Field: The dancing, oh yeah, we choreographed every moment of that. (She laughs.) No, we just did it. As a matter of fact, I don’t think (Michael) knew I was going to do it. I didn’t know what I was going to do. You only see a second of it, but he actually let it go on for a very long time until I was like a rag. (She laughs.) Really, he let it go on for 20 minutes. It was like an aerobics class. I was drenched in sweat. I thought I was going to blow both of my knees. I’m glad (Michael) enjoyed it. Q: While Doris is crazy about John, John seems completely oblivious to Doris’ feelings. Field: John is blissfully ignorant about what’s going on inside of Doris. Q: What did you learn about yourself playing Doris and why? Field: I didn’t learn anything about myself from playing Doris, really. I loved being with her but I don’t think I learned anything of myself. Doris is a whole of me in reality … I feel like Michael and I were separated at birth or something because he’s Doris. Here is Doris right here. This is certainly his voice, except said through my mouth. Maybe in being here a couple of years no—I don’t mean right here, although it’s starting to feel that way. Sorry I had to take that joke—it takes a while to look back on what you do if you ever have the bravery to do that. You realize there’s some part of that character that sticks with you. You look back on it and a memory will flash through your head, and go, “Wait a minute. That didn’t happen to me. That happened to my character. So that wasn’t really my experience.” And yet somehow it incorporated in my little medley of experiences as if it were mine. So playing these characters, if you have the opportunity to play these characters that are three-dimensional and very deeply rooted in an emotional level, they stay with you. They lived in you anyway, the density of them. It takes a while to realize how they’ve influenced you. Q: What was your favorite scene in the film? What was not like anything you’d done before? Field: There’s not a moment in this film like anything I’ve ever done before. Not a moment. Not a second of anything I’ve done before. Q: What do you like about the tone of the film? Q: Was there an item you wanted to take home from this movie?